Looking for something unusual? This is not a pretty fish, however its leaf-like camouflage gives it an appearance appealing to aquarists looking for something a bit out of the ordinary. Aside from its rugged skin (which, incidentally, it periodically sheds like a snake), the fish has tiny eyes and a very odd method of swimming. 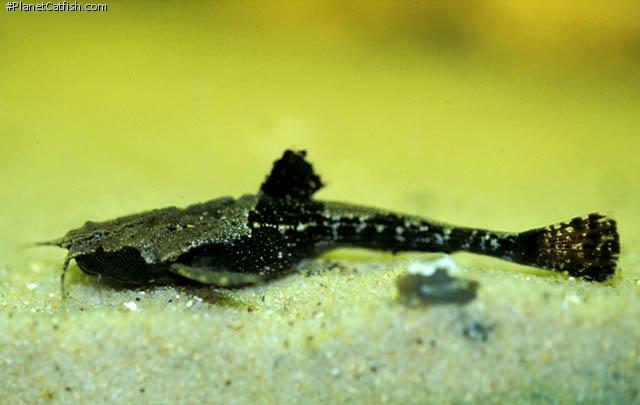 Banjo catfish expel water through their gills, making their swimming movement (I.E. irregular spurting bursts) somewhat comical. This swimming however is a rare sight as these fish spend 99% of their time inactive to the point of looking dead. Feeding usually initiates some action in Banjos, however you almost have to drop the food right on the fish for it to react. Feeding after lights out will ensure that these fish get their share of food. I have never had any problems with Banjo Catfish either through illness oraggression towards their tankmates or fellow banjos. If you find their craggy appearance interesting then these fish are ideal as a community tank curio. There are 214 registered keepers, view all "my cats" data.